And here you thought that Center Court was the only place where the stars came out to play. Pshaw! Sorry, Serena & Ana, Rafa & Roger, you’re just gonna have to take backseat on this one. 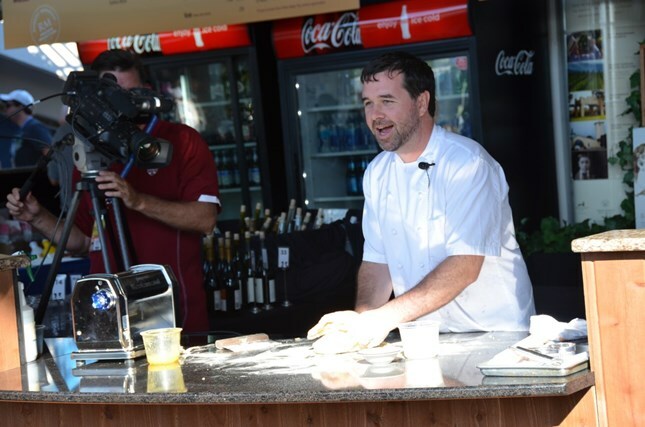 Over the next few days, some of the greatest talents in the Greater Cincy culinary world will be landing in Mason and rustling up some serious action inside The Lindner Family Tennis Center. ‘Cause, you know, that’s what the Western & Southern Open is all about. “It’s not just about the tennis,” you say? Not hardly, dear friends. Not hardly. In fact, I dare say it’s quite possible to spend the entirety of your tenure at the tournament exploring, imbibing, socializing, and otherwise just living it up. Notice that “taking in the tennis,” was nowhere on that list. There’s so much to do (and the vibe is so pitch-perfect— picture a cross between a beach resort and say… a higher-end summertime arts/music festival), that you could check in to the tournament every day and still not actually see any tennis. Of course, we don’t advise that. But if you’re curious at how you could spend your time at a tennis tournament not watching tennis, we suggest you click through to read the complete article on Cincinnati Refined.